The Jeanneau Sun Odyssey 44 Deck Salon delivers a great layout and an ergonomic deck in a value-priced design. 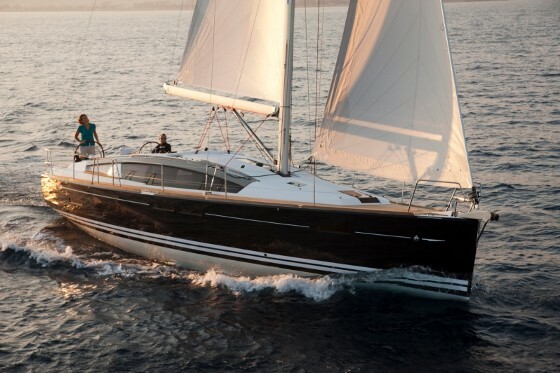 The Jeanneau Sun Odyssey 379 showed how intelligent design can make the most use out of limited space. 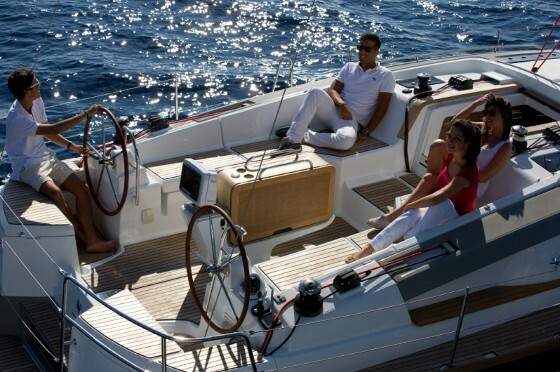 And when that limit is expanded, you can get a package like the Jeanneau Sun Odyssey 44 Deck Salon. Innovative details, a cavernous interior and a new sleek deck really set the Sun Odyssey 44DS apart even from her sister Jeanneaus. 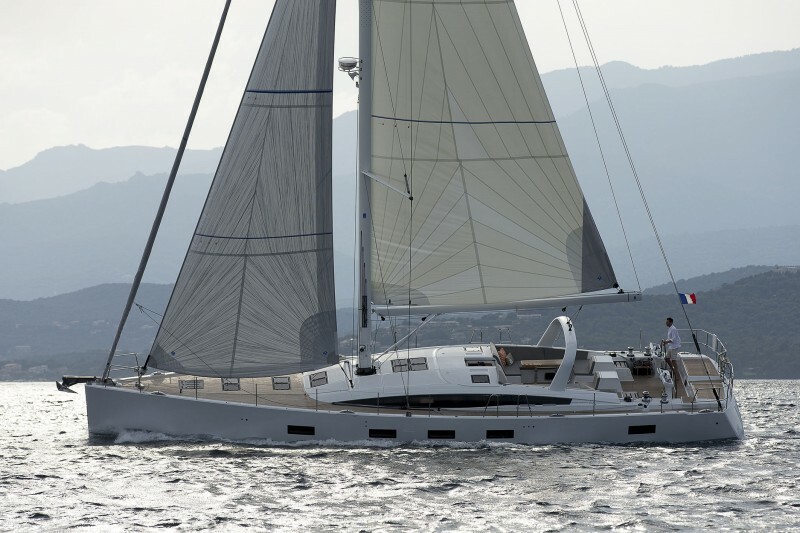 The 44 DS still has the look of a Jeanneau, but with some added flair. It’s hard to miss this boat’s profile. Standing on the dock, I noticed the “swoopy eye” of the side ports is still present, as on the others of the Jeanneau deck salon line. But it’s been stretched and looks lower and sleeker. The elongated port now integrates better into the lines of the coach-roof, which extends back seamlessly into the cockpit coaming. The 44DS has bold styling and fits between existing 42 and 45-foot models (neither of which it will be replacing, according to company representatives). The new hull shape has a broader beam carried farther aft and a chine visible just above the waterline. The hull is solid glass, hence the 22,000 pound displacement, and has an integral grid beneath the cabin sole for extra strength and to distribute the keel loads. 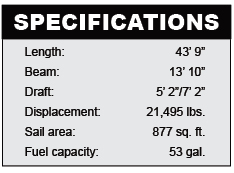 The T-shaped, cast iron bulb keel is available in shoal draft (5’ 2”) or deep draft (7’ 2”). The 9/10 fractional rig has a deck-stepped mast with double spreaders and comes standard with a furling mainsail. 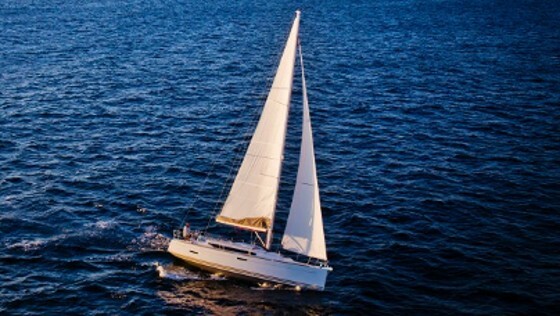 Together with the standard 106% headsail, there’s a total of 877 square feet of sail area. A self-tacking jib is an option. All lines are led aft in covered channels, so the decks are clear and easy to navigate all the way forward—where a Quick 1000W windlass and a double roller make easy work of anchoring. I had the good fortune to see the 45DS and the 44DS side by side, and that made the new features really stand out. First, it’s much easier to board the new 44 from the transom, which has an opening middle section and two easy steps up between the twin helms. Winches are within reach of each wheel and the swiveling Simrad chartplotter is visible from both. Second, moving about the long and sculpted cockpit and up onto the side decks is a breeze, with molded sections that are easy to maneuver. The companionway has also been redesigned with an ample bridge deck to keep out any wayward wave. The washboard entry slides up and down and is adjustable with positive locks so it can be part-way open. Even better, you don’t have to find a space to store the board when not in use. A built-in sheet box on the sole at the entry is perfect for getting the lines from underfoot. Spaciousness both inside and out is a key theme in the 44DS, as you can see in the cockpit. The Sun Odyssey 44DS is a true owner’s boat rather than a charter design, and it comes standard with two large cabins and two ensuite heads. There’s an option to wedge a third cabin with offset upper and lower bunks into what is now the desk area on the port side of the guest cabin. For families with kids this will work nicely, but most will choose the two cabin/two head layout. The three things I noticed as soon as I came down the steps is the feeling of spaciousness, the obvious attention to detail, and the innovative features that are packed in the most unexpected places. Superyacht interior designer Frank Darnet likes sweeping open spaces, so the 44DS is quite roomy, with a Euro flair and lots of gleaming and leather accents. The master stateroom is aft with a king sized bed and room for two flanking seats as well as many lockers. Nobody will be roughing it in this luxe stateroom, which even has a nice transom port to provide light and air. 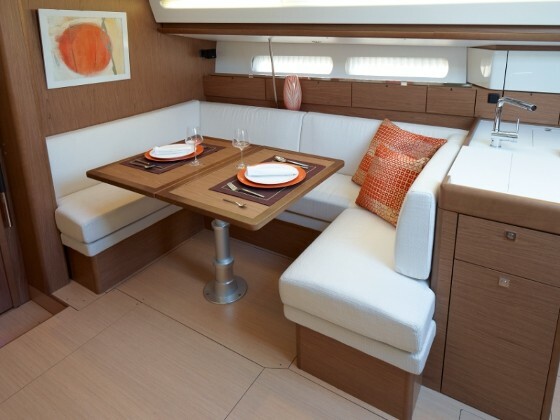 The saloon has a U-shaped dinette to starboard that has a unique table which folds to create a smaller cocktail table and swivels, unfolds, and lowers electrically to form a nice double berth. The straight settee to port forms the seat for the aft facing full-sized nav station, which has a built-in laptop nook and an optional freezer below. A flat screen TV does double-duty as entertainment or as a repeater for the Simrad plotter. The interior finish features a contrast between dark and light woods and cabinetry. The two heads are large and both have separate stall showers and lots of Corian counter space. Electric heads are optional. The guest cabin forward features a smaller island berth and a nice desk, in case you want to keep your office space separate from your navigation area. The galley is a little short on countertop space but has an ingenious folding top that slides over the sink and provides an extra work area. A microwave, a top-loading fridge, and a two-burner stove/oven will please just about any galley slave. The interior finish and the dark walnut color with faux wood grain is nicely offset by plenty of white cabinetry and gleaming stainless fixtures; there are those who profess to love the look, but this is a matter of taste. The engine is under the companionway, which lifts on gas struts. All service points are pretty easy to reach, but the optional Onan 4kW genset is tucked into the port stern quarter so it’s tighter to get to and generates a bit of noise in the master. Clever rails are built under the long side windows, and provide good handholds as you move along the massive saloon—which takes up nearly all of the boat’s 13’ 10” beam. The entire interior is bright, due to the large side ports and overhead hatches that open in either direction. Tankage could be considered light, for long-distance cruisers. With 53 gallons of fuel and 87 gallons of water, this sizable boat is definitely a coastal cruiser and you’ll be happy to have access to a marina on a regular basis. That said, it’s perfect for weekending and great when the boat is a second home near facilities. 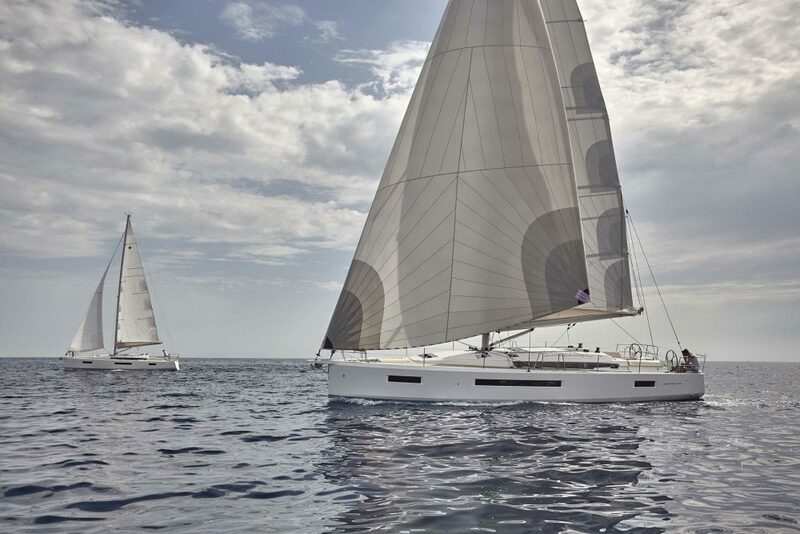 With the new hull design, the Jeanneau 44DS not only looks fast, it sails fast—and with various sail plan options, is easily sailed by a couple. The ergonomic deck also provides lots of room and is easy to move about without a lot of shin banging obstacles. 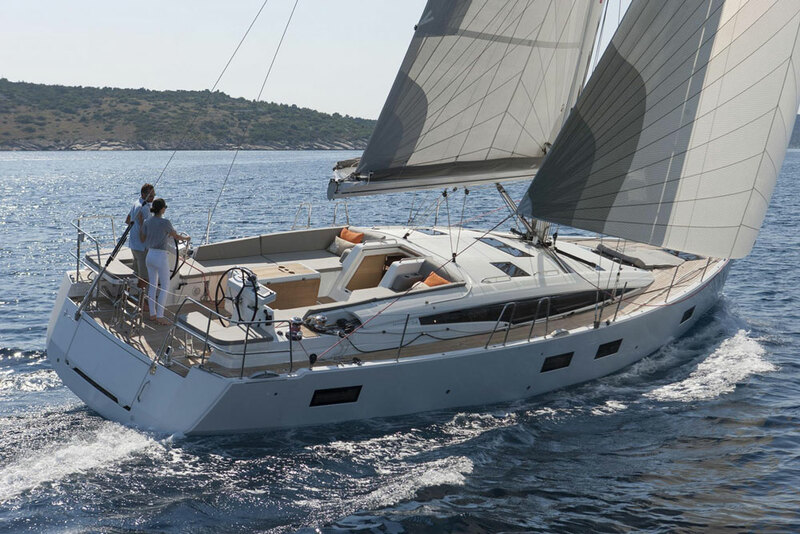 Mostly however, the 44 is a good value due to Jeanneau’s highly efficient build practices in their state-of-the art facilities in France. The design is packed with amenities and the base price is $250,000. 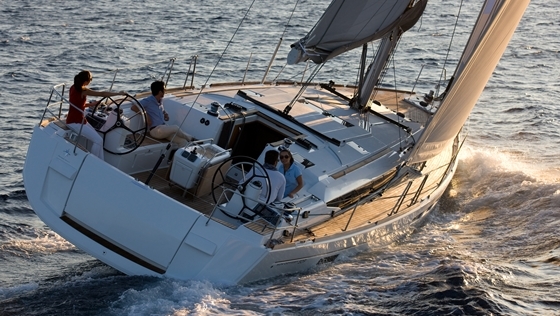 Various upgrades are available including Jeanneau’s proprietary 360-degree docking feature. This ZF system integrates their POD 90, the 54 hp Yanmar and a Maxpower bow thruster for easy joystick control. 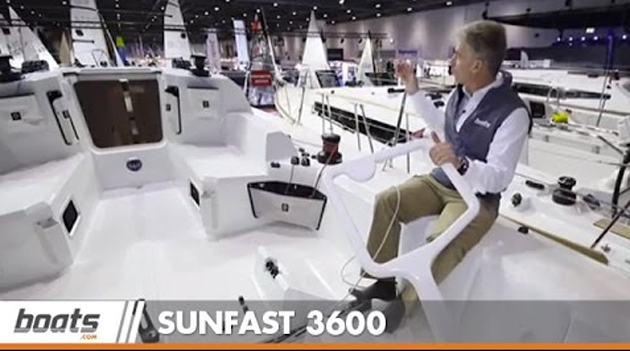 Fully loaded, the sail-away price is closer to $310,000—which is still a lot of boat for the money. 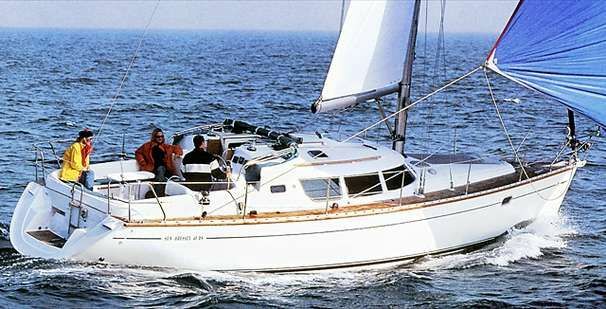 Other Choices: There are a number of designs that are comparable including the Bavaria Vision 46 which has a friendly interior layout and a large owner’s stateroom forward, and the Beneteau Sense 43 that has become known for its enormous cockpit and sleek exterior. 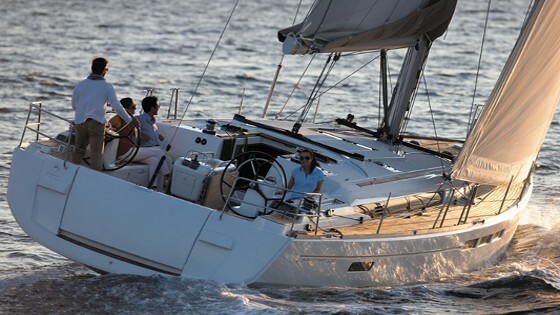 For more information, visit the Jeanneau Sun Odyssey 44 Deck Salon web page.